Update, May 19: For Honor Season Six is underway now, and the start of the new season brings with it a new seasonal event called the Rite of Champions. The Rite of Champions, which you can play now through May 31st, involves a 4v4 limited-time game mode called Carousel of Death. During the Rite of Champions, you’ll be able to loot special outfits, weapons, ornaments, and effects that harken back to legendary heroes of the past. There’s a trailer for Rite of Champions out now, which you can watch below. Original story, May 3: Another For Honor season is on the way, and very soon. Titled Hero’s March, the game’s sixth season is set to bring a new map, big Hero reworks, as well as a new way to track your cosmetics when the update launches later this month. Beachhead is the new map, a Japanese fortress taking inspiration from a campaign map, though the actual layout is all original. You can check out a proper overview via the reveal stream here, but the map will be free to everyone, up in every mode except Tribute. Reworks will hit two of the game’s Heroes. Peacekeeper will see most moves nerfed for damage, but those will be balanced out with the ability to stack bleeds. 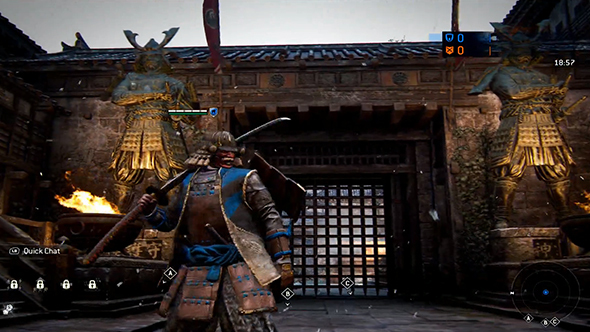 Orochi will have heavy changes to Riptide Strike and Storm Rush, and will get three new chains. An inventory system overhaul is also coming with the Visual Collection, letting players track their cosmetics and apply them via a separate in-game menu. Ubisoft say this addresses feedback about lack of inventory space, and should reduce everyone’s need hoard gear along the way. Ubisoft ran a stream breaking down Hero’s March which you watch in full here, or you can check in on Reddit for a detailed recap of what was shown. For Honor Season Six goes live on May 17, and you can currently hop into the game via a free weekend lasting until May 6.